Nordic storm is a quality snus at a fair price, produced in Sweden with a perfect combination of taste and strength. It has been described as a future classic and has received good reviews from snus users, where above all the taste experience is highlighted as something above average. 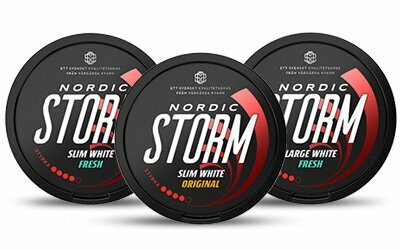 Storm is the series of products that deliver the strongest snus from the Nordic Snus selection and is suitable for anyone who wants a powerful experience. The level of nicotine is as strong as 16 mg and is the result of an increased demand from users across the country for a stronger and more potent snus. Nordic Storm is, in other words, not for those who want an easy-going snus, rather the opposite. The flavours vary between bergamot and mint and can be bought both in the sizes Slim and Large - whichever you prefer. Apart from the tobacco, it is no exaggeration to say that the customer's experience is the centre of attention for Nordic Snus. This is evident by their passion for creating high quality products, much appreciated by their customers. Nordic Snus is produced in Vårgårda Kvarn, only steps from Gothenburg on the Swedish west coast. With a selection that includes well reputed brands such as LD, Gustavus and, in this case, Nordic Storm, the producer is a natural choice for a customer that values taste and quality but doesn't want to smash the piggy bank. The base of the product is a specially selected tobacco of a very high quality and it is manufactured by a modern process. The quality does not only come from the selected tobacco plants but also from the production process, where only water, salt and specific flavours are added. Therefore, Nordic Storm is free from unnecessary additives that otherwise would lower both taste and feeling. In the old grinder of Vårgårda that traces back to the 16th century, locally produced renewable energy is used to keep the production going, a measure that proves the interest Nordic Snus has in actively decreasing the effects on the environment that their product might have. Nordic Snus is part of JTI and the tobacco being used is therefore produced by JTI. As a customer you can therefore be assured it has been produced under good conditions. The suppliers mainly come from India, Serbia, Argentina and Brazil and meet all the demands of being suppliers to JTI. These demands are not just related to the environment, they’re also demands regarding manufacturing and working conditions. Therefore, Nordic Snus never need doubt that the tobacco being delivered is of the highest quality, but Nordic Snus still performs quality checks on delivery. To assure the product meets the demands, the finished products are also tested for quality and flavour. Nordic Storm Slim White Original has a well-balanced tobacco and bergamot flavour with a high nicotine level. The portions are slimmer and therefore less runny, which assures a more long-lasting flavour as well as a better and more discrete fit. The snus come in a smart tin containing 24 well filled portions. Also available in a Fresh version. Nordic Storm Large White Fresh has a refreshing flavour of peppermint and menthol combined with a spicy tobacco flavour. Like Slim White, it has a high nicotine level. The larger portions provide a fuller sensation, they are less runny, and they guarantee a long-lasting flavour. White Fresh is also available in a Slim version and will be delivered with 24 portions in a tin with an MP-lid. All of Nordic Snus’ products have the label Swedish Quality Snus, a QA for the product. It's a given that most people would want a product with a lot of flavour that lasts a long time. Anyone who likes a strong, powerful snus should try Nordic Storm. The well-balanced strength, the power of the tobacco and its high nicotine level gives it an explosive character that is coveted by people who use snus all over Sweden. It is also available in a more discrete format, Slim, and that is not all. You will get a high-quality snus that has been manufactured in accordance with strict social and environmental demands. Trying both flavours are highly recommended, not just to decide which one you like the most, but also to actually have tried these Swedish miracles on the snus-market. Nordic Storm is made for those who want to gain as much as possible from this experience and who want their money’s worth. It is priced somewhere in the mid-range and is one of the best choices in this segment. The chance of Nordic Storm becoming a major favourite is imminent and it is believed to become a classic that will have a place in many people’s pockets for years to come. Give it a chance and see what you think, we find it hard to believe that you will be disappointed.